Corr joined the UÂ’s in June 2015 on a free transfer from Southend and quickly became a fan favourite, scoring twelve times from 22 matches in his first season with the club. Unfortunately for the 32-year-old and the Amber Army, he has spent 18 months on the sidelines as a result of injuries. "We would like to thank Barry for his true professionalism in what has been a very troublesome 18 month period as a result of his injuries.Â” said Cambridge United Head Coach Shaun Derry. "It has been a frustrating situation for both parties and this has by no means been an easy decision to make for the Football Club. "It goes without saying that we wish Barry the best of luck for the future." Head of Football Operations, Ben Strang, added: "We wanted to give the process of Barry's recovery sufficient time to be well informed in our decision on Barry's future. He has been hugely respected and well-liked by supporters, players and staff alike during his two years with the club." 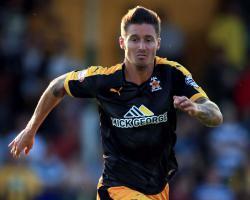 Corr leaves the Cambs Glass Stadium after two seasons and a total of 29 games for United and 14 goals.